As proud hosts, we always aim to please. We make sure our friends leave happy with plans for the next get-together, their empty wine tote and significant other in tow. Hosting is a tricky task at times, especially when guests have to tip toe around your decadent red velvet cake because of their food allergies… we’re lookin’ at you, gluten! A gluten-free diet doesn’t mean bland, boring and blah. Your gluten-free guests have a sweet tooth too and with it, comes a chance to take your hosting talents (and thoughtfulness!) to the next level. Whether it’s a workshop, a corporate event or especially your wedding welcome gift, we’ve got you covered on gluten-free treats. These M&G favorites are sure to please. Popsations’ Crabby Caramel Popcorn: Who knew something so sweet could be gluten- free? Crabby Caramel features caramel popcorn with a hint of Old Bay seasoning: a surprising and delicious combination of flavors! Route 11 Chips in Chesapeake Crab: The same special blend of ground peppers, salt and sugar used by mid-Atlantic watermen are combined for a salty snack, perfect for tailgates! Dolle’s Salt Water Taffy: A sweet shop tradition, perfected by Dolle’s for an all-natural, gluten-free sweet treat that will make your guests melt faster than the taffy they chew! Nouri Bar in Apple Cinnamon Spice: A gluten-free snack good for the heart and soul! For every NOURI bar purchased, NOURI donates one meal to a hungry child in school. Not only will you be pleasing your guests, you’ll be providing to a child in need. Sold in an assortment including Peanut Butter & Wild Cherry and Creamy Cashew. Boston Fruit Slices: A treat for the littlest of gluten-free guests, or a delicious throwback for you and your friends! Charmed Bar in Almond Butter Cran-dipity: Craving a little healthy? Go gluten-, dairy-, soy- and refined sugar-free! A mouthful of words for a simple and delicious snack for the health-nut in the bunch! 2Armadillos Chickpeas in Cinnamon Toast: A healthy alternative to sweetening up your humdrum mixed-nut tray while providing a safe snack for gluten-free guests! Sugarfina Gummies in Champagne Bears: Our newest obsession and praised by Cosmo! These grown-up gummies are spiked with a bit of the bubbly for a cute and chic treat during a girl’s night in or your next personal day. Don’t worry, we won’t tell the boss! Available in a perfect combination of Brut and Rose. Krave Beef Jerkey in Sweet Chipotle: Kickin’ chipotle flavor isn’t limited to the grill! Your guests will love this all natural and hand sliced snack. They won’t believe it’s gluten free! Sugarfina Sweetheart Honey Beans: Could these be any cuter? Naturally infused with real honey and packaged in an assortment of 16 flavors for a variety you and your guests are sure to love! Peeled Snacks in Mango: Healthy, fruity and gluten-free! Can snacking get any sweeter? 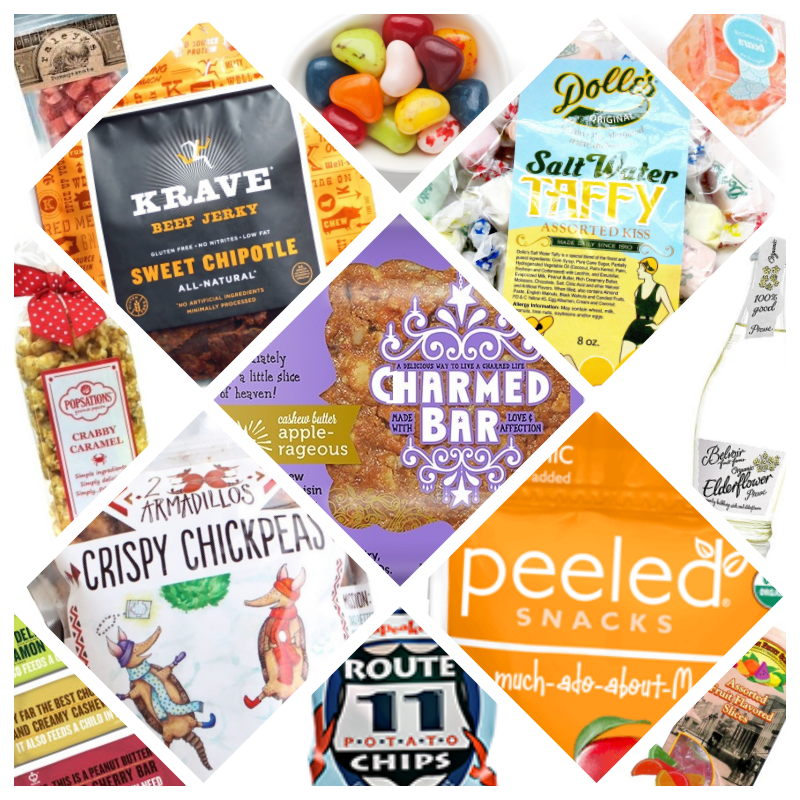 Peeled organic snacks is a healthy way to satisfy your friends’ sweet tooth! Raley’s Candy in Pomegranate: These tangy little treats are handmade and packaged for easy serving, or to sneak one for yourself! *sorry ladies and gents...vodka is not gluten-free! Hope this list has given you some good ideas! If you'd like more help with your gifting, please visit here to inquire about our Custom Gift Design Service.